What a great way to start off 2014, with a gorgeous tabletop and some wonderful vendors for the blog Style Unveiled! Of course it is only fitting to base our design off of the pantone color of the year, Radiant Orchid. I hope you enjoy this tabletop as much as I do! We just loved how lush and rich these florals were! Every piece of this look screams opulence and beauty. The deep, dark colors were brought to life when surrounded by shimmering gold sequins and chains. Take a look at one of our favorite and most versatile designs! We just love our "rolling hills" as they can take on any look- organic and modern, lush and fun, or romantic and sultry. With ivory taper candles nestled between the lush florals, these gold sequined rolling hills took our breath away! Who says bouquets have to all look the same? We at SYED do not believe that to be true, and loved having the opportunity to get creative with the bouquet below. Rather than using a traditional wrapped handle, we designed this with more of a purse feel. So fun! And be sure to check out or gorgeous chair accents below! 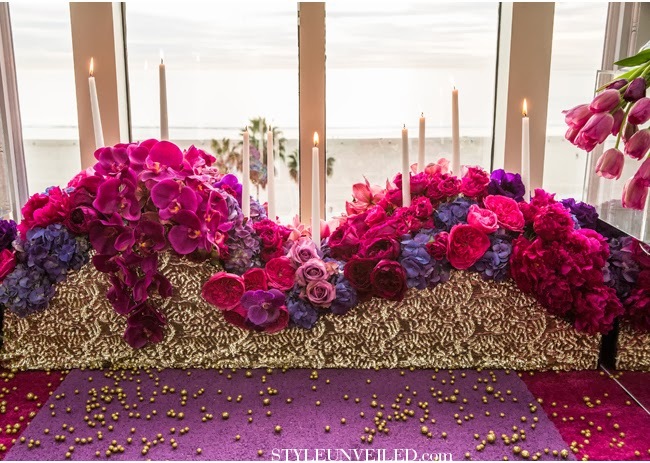 The mixture of deep purples and magentas really tied the tables to the chairs and made each centerpiece flow beautifully. A special thanks to all of the vendors who participated in this shoot!